This basilica is one of the oldest and most important shrines in the world dedicated to the Blessed Virgin Mary. In fact, it was built at her request! According to tradition, a Roman Patrician, Giovanni and his wife, were childless and prayed to the Blessed Mother that she would designate an heir for them to bequeath their wealth. They had a vision in which the Blessed Mother told them that she wished to have a church built in her honor on the Esquiline Hill and the sign to verify this dream the prospective layout of the church would be outlined in snow. This in the month of August! When Giovanni approached his friend, Pope Liberius, with this news he was amazed to find out that on the night of August 4th, 352, the Virgin Mary had appeared to Pope Liberius (352-366) as well. She said a miraculous snowfall would occur that would outline where the church was to be built in her honor. The next day August 5th, snow indeed did fall on the Esquiline Hill in Rome in the middle of a heat wave. The people staked off the outline of the future Basilica before the snow could melt. Pope Liberius immediately ordered the basilica to be built. The event provided us with one of Our Lady’s oldest titles, Our Lady of the Snows. St. Mary Major contains some the finest artwork and architectural wonders in the world. The ceiling is a masterpiece of the Renaissance and the work of Giuliano da Sangallo. It is gilded with the first gold brought to Spain from the New World by Christopher Columbus as a present to Pope Alexander VI from Ferdinand and Isabella of Spain. 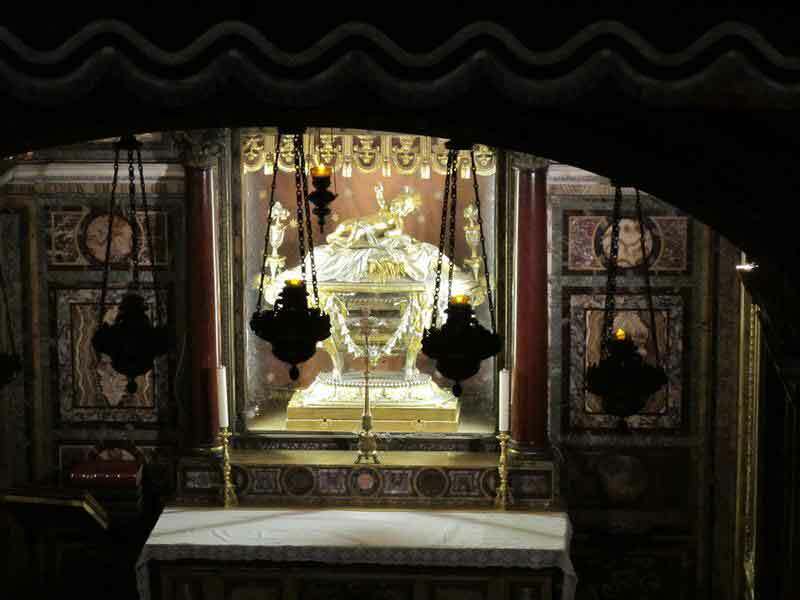 The most notable is a relic of the manger from Bethlehem in which the baby Jesus was lain. This is venerated under the High Altar of the Basilica. Facing this magnificent relic is a marble statue of Pope Pius IX, who proclaimed the dogma of the Immaculate Conception in 1854. The second is the painting of the Blessed Mother known as the Salus Populi Romani, (The Salvation of the Roman People) for the exceptional devotion, which the people of Rome have for this image of the Virgin. Tradition attributes the painting to St. Luke. This image had been brought back from the Holy Land by St. Helena, mother of the Emperor Constantine. During the pontificate of Pope St. Gregory the Great (590-604) a plague attacked the people of Rome and the Pope carried the image in procession to pray to their Protectoress for an end to the plague. When the plague ended, the pontiff solemnly placed crowns of gold and gems on the heads of Mary and the child Jesus on the miraculous image. Also of interest is the altar in the Sistine Chapel (not the same as the one in Saint Peter’s of course) at which Saint Ignatius of Loyola, founder of the Jesuits, celebrated his first Mass on Christmas Eve, 1538. Pope Francis, the day after his election as Pope, visited Saint Mary Major to pay tribute to the Blessed Mother and to pray at this same altar. And he often visits here, especially before and after any foreign trips. The liturgical Feast of the Dedication of the Basilica of Saint Mary Major is celebrated each year on the 5th of August. A beautiful custom is kept to remember the miraculous snowfall. At the conclusion of the Solemn Mass of that day a shower of white rose petals falls from the dome of the Chapel of Our Lady where the image is kept. Two Popes are entombed here: Sixtus V and Saint Pius V.
The Basilica is open daily from 7:00 am until 6:45 pm. There are Masses throughout the day, with the first daily Mass at 7:00 a.m. and the last one at 6:00 p.m. Check their website for the complete liturgical schedule. For help finding your way around, we suggest the “Little Black Book of Rome” It is organized by location rather than alphabetically like so many guide books. And we also suggest you carry a “Streetwise Map of Rome” for easy navigating.